Mabongnim Halmeoni Tteokbokki – My favourite Seoul eat! Introducing my favorite eat in Seoul – Mabongnim Halmeoni Tteokbokki! Tteokbokki is like the Pad Thai of Bangkok for Seoul. Everyone should try it at least once. Tteokbokki (떡볶이) is so popular in Seoul that they even have a Tteokbokki street that is lined up with restaurants selling Tteokbokki. 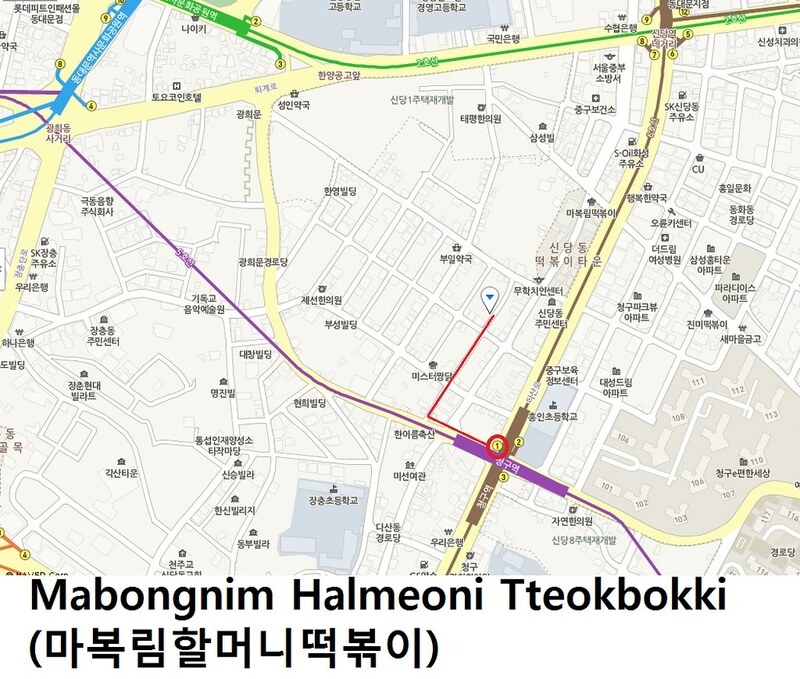 It was said that Mabongnim Halmeoni Tteokbokki is the first Tteokbokki shop that sprung up at this street. It brought in so much crowd that other Tteokbokki restaurants started popping up and eventually became the Tteokbokki street today. 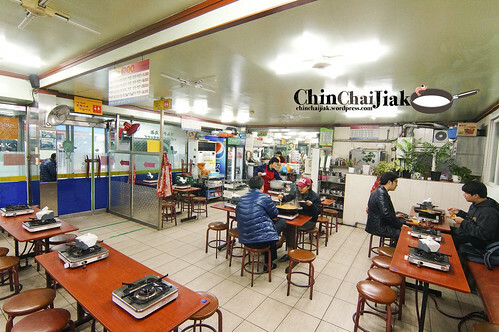 This restaurant has been cooking up hot, delicious tteokbokki for over 60 years, ever since it started up in 1953. The thing I like about Mabongnim Halmeoni Tteokbokki is they start their operation at 8am! As much as possible I always like to plan my food itinerary in a way that I will avoid dining crowd. I reached here at about 9am and as expected – No crowd! I like their no-menu style of eating when all I need to tell tell them is for how many pax. The price is W$11000 (about S$13.00) for two pax and W$24000 (about S$28.00) for five pax. Isn’t that rather inexpensive considering the quantity of the food? 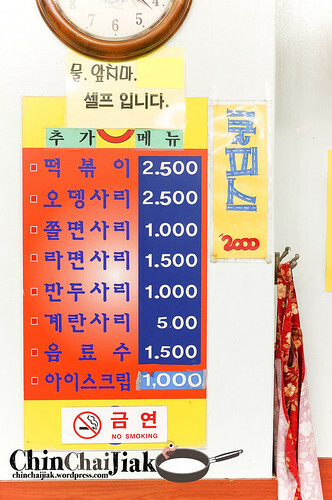 In Singapore’s Korean Restaurant, typically a plate of snack-size Tteokbokki already cost S$12++ ($14 nett). Don’t forget that I am actually having breakfast, the heartiest breakfast for the whole of my Seoul trip! It’s served initially as a clear broth and I am suppose to mix in the paste and stir as it’s brought to boil, then simmer to get a thick Gochujang (고추장) sauce. Gochujang is a kind of red chili pepper paste. It’s main ingredient consist of starch, salt and red chili pepper powder. Gochujang is used to season and marinate many Korean foods, and is the main seasoning for Tteokbokki and can be bought in supermarket. I read that Mabongnim Halmeoni Tteokbokki made their own Gochujang sauce as they know how important a good Gochujang is as it will directly affect the quality of Tteokbokki. Mabongnim Halmeoni’s Tteok (rice cake) is really my kind of rice cake. It taste very fresh, soft, chewy but yet easily separable without challenging too much of my jaw muscle. But in fact, my favorite is not even the rice cake. 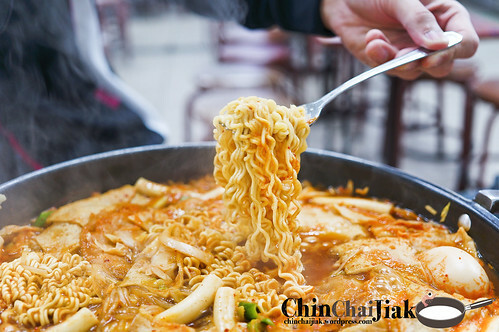 My favorite items are the two kinds of noodles – the Ramyeon (라면), or we known it as Maggie mee, and the Jjolmyeon (쫄면). 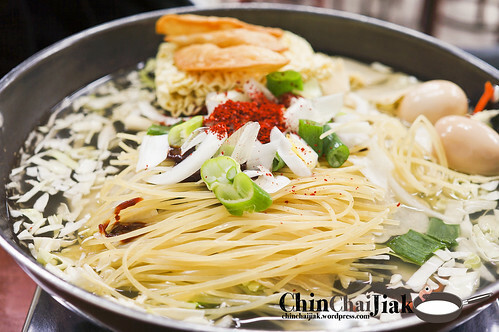 Jjolmyeon is a kind of Korean Noodle that is thick, chewy, that is made of wheat flour and starch. The noodles was boiled to softness in the broth which the noodle absorbed the sweet and spicy flavor that made it… I wanted to say “heavenly” but probably I should not raise the bar too high , so I think i shall stick to “an exceptionally enjoyable Maggie mee experience”. 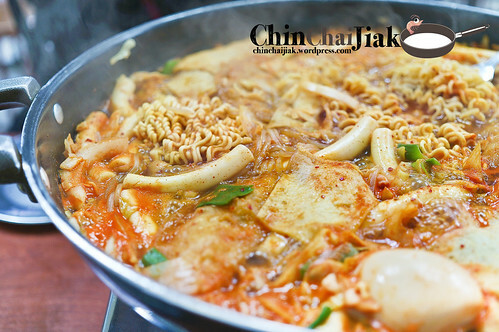 Apart from the Tteok, Ramyeon and Jjeolmyeon, vegetables such as cabbage, carrots, onions and green onions are also added. The next best thing is their fried mandu (dumpling). Do not ever eat the mandu before mixing it into the Gochujang. It just taste soggy, a little tasteless but it’s totally different after soaking it in the Gochujang as the sauce seeps into the mandu skin. I mentioned earlier that i did not have any add-on for my Tteokbokki but i can choose again for just one add-on, it will be the fried mandu. If you like, mash up the eggs and mix them into the sauce as well. 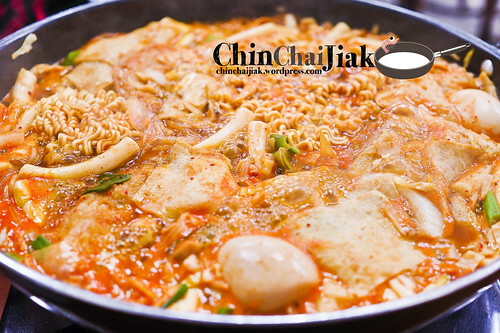 The Tteokbokki also comes with a banchan (side dish) of danmuji (단무지), a sweet and sour yellow pickled radish that goes well with the hot, spiciness of Tteokbokki. By visiting Mabongnim Halmeoni Tteokbokki, i can now really taste the difference between Singapore’s Tteokbokki and Seoul’s. Mabongnim Halmeoni Tteokbokki is much more spicy and flavorful but yet not over-cloying (or “Gelat” as we Singaporean knows it). The least i expect is that we are able to finish the whole pot of Tteokbokki as breakfast! I have a strong personal liking for Mabongnim Halmeoni Tteokbokki. If not for my already planned itinerary to other restaurants, i would have returned to Mabongnim Halmeoni Tteokbokki a second time. 1. Exit from Exit 1 of Cheonggu Station and walk straight to the right. 2. Turn right again when you arrive at the playground and go straight for 200m. 3. 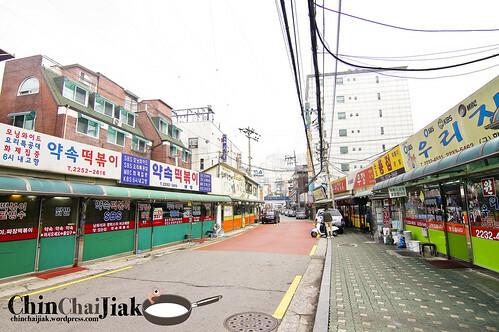 You should arrive at a street with many restaurants and there you are – you are at the Tteokbokki Street. 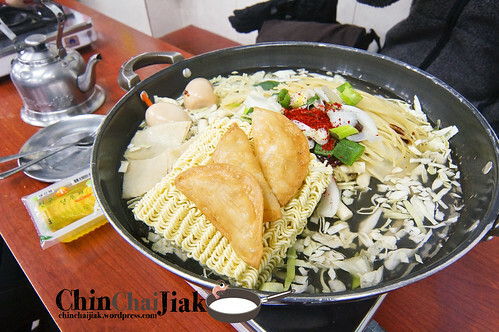 Posted in Dishes - Tteokbokki, Location - Cheonggu, Type - Traditional Korean Food.